Ulu maika was an ancient Hawaiian sport with some similarities to bowling. This traditional pastime was played with a few variations, all entailing rolling a small disk-shaped stone down a specially prepared path called the kahuamaika (literally “place of maika”). In the most common variant, two competitors would take turns rolling an ulu (stone) down the path, each attempting to roll theirs farther than their opponent’s. As was the case for many traditional Hawaiian sports, including mokomoko (boxing), he’e holua (lava sledding), and even surfing, betting was an inseparable part of ulu maika. Some accounts of the sport even suggest that natives would often search for competitors to start a match purely for the purpose of wagering. These spectators would first evaluate the athletes’ physiques, supernatural signs, and other perceived factors, then they would place their bets, pray for victory, and cheer on their respective champions. Partially because of this kind of behavior, ulu maika (along with most other traditional Hawaiian sports) was a target of suppression under increasing Western missionary influence in the 19th century, contributing to the sport’s eventual extinction. Though the game has undergone somewhat of a modern revival in the interest of preserving traditional Hawaiian culture, it is doubtful that this new sport is exactly the same, as many details of the original sport were not precisely recorded. If you want to play ulu maika today, you’ll need a few tent pegs and some thick, disc-shaped stones (or bocce balls if you’re having trouble finding the right shape). See Play Today! below for a full explanation. Ulu maika’s nomenclature is not always explained clearly in most sources, causing some confusion. The terms ulu, maika, and the compound ulu maika can all interchangeably refer to the stones and the sport itself. In Hawaiian Antiquities: (Moolelo Hawaii) (1903), Hawaiian historian Davida Malo clarifies that the term ulu likely originally referred to the half-ripe breadfruit that was typically used for the sport in ancient times. The spherical stones made of coarse, porous rock that were used in the early history of the sport were likely referred to by the same term as well. It appears that the term maika was given to the later-developed disc-shaped stones, which would be made with either porous or smooth rock (as detailed under Equipment further down). The implication is that throughout the sport’s history, these terms became conflated. As Hawaii had no written language until some time after European contact in the 18th century, there is no recorded history of ulu maika prior to this period. As such, it isn’t feasible to determine at what point in time this sport began to develop. Because the Hawaiian Islands were likely settled in the 4th century AD, the sport could theoretically date to a similar period, though this is speculation. With several eyewitness accounts of the sport in the 19th century, we can be sure that ulu maika dates back to that period at the latest. It would not be unreasonable to assume its practice stretches back a few centuries prior, following a similar timeline of surfing and other traditional sports. Moreover, the time needed for ulu maika to evolve from the use of unripe breadfruit to the use of carved stones, in addition to the time needed for the names of the two to be conflated (as explained under Nomenclature above), would further indicate a lengthy history of the sport. As briefly mentioned above, increasing missionary influence in the Hawaiian Islands, among other factors, contributed to somewhat of an unraveling of traditional Hawaiian culture in the 19th century. These missionaries discouraged all practices they deemed pagan, dangerous, or generally undesirable. With gambling being a central part of many ancient Hawaiian sports, they were prime targets. A consequence of this was that many traditional sports and games, including ulu maika, underwent a sharp decline in practice. While some sports recovered from this decline, ulu maika was one among those that vanished completely. (As Davida Malo, the aforementioned Hawaiian scholar, is clearly unable to find its practice anywhere in Hawaii at the time of writing, it appears that the sport went completely extinct sometime in the 19th century.) Because the original ulu maika has been out of practice for so long, and due to a lack of comprehensive accounts of its practice throughout this period, the finer details of the sport have been lost. Ulu maika may have had some influence on the wild popularity of bowling in 19th- and 20th-century Hawaii. As early as the 1840s, Hawaii had been swept up in somewhat of a bowling craze (that is, bowling with pins and all – not ulu maika). It may have been the case that because of the familiarity of some of bowling’s mechanics, athletes easily switched over to the sport during ulu maika’s suppression. While some of the other traditional Hawaiian sports had no Western equivalent and were perhaps more likely to be revitalized in the 20th century, bowling likely filled the gap left by ulu maika’s absence. The sport’s rising popularity throughout this period is clear; by 1954, Oahu, the third largest of the Hawaiian Islands, had 10 bowling alleys alone. It seems that with the wide popularity of this Western sport, there was little national incentive to bring back its traditional Hawaiian cousin. The distance competition appears to have been fairly simple. Each athlete would have a chance to roll their stone down the kahuamaika (course), and whoever rolled theirs farther took the victory. However, there is some confusion here due to scant information. The leading issue stems from a seemingly blatant unfairness in the sport. 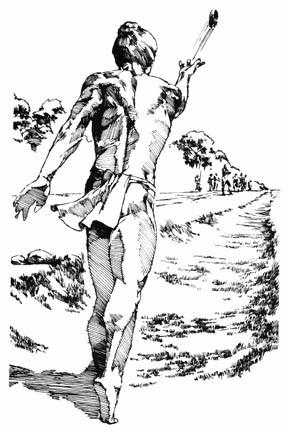 Many sources suggest that the first athlete’s stone was typically not removed from the track after their throw, which would create an obvious disadvantage for the second player. Even if they were to roll their stone with much more precision and speed than their opponent had, it would likely be stopped if it were to strike the other’s resting stone. This inherent imbalance could perhaps be explained by the existence of some sort of random method to determine who would go first (some ancient Hawaiian equivalent to flipping a coin), though none of the records of the sport indicate such a practice. It could also be the case that the second competitor accepted the obstacle as an understood challenge, hoping to outperform the opponent despite the setback and perhaps secure a more honorable victory. (This kind of prideful attitude can be clearly seen in the traditional Hawaiian boxing sport mokomoko, in which the athletes would willingly receive many of their opponent’s blows.) A simple solution would be that the first athlete’s stone was removed and its resting spot on the course marked, but there is no indication that this happened. Some sources reference another competitive variant of the game in which the opponents tried to break each other’s stones. It is typically assumed that the athletes bowled toward each other – however, it may be the case this was merely a mechanic of the variant discussed above. That is, if the first athlete were to leave their maika sitting on the course, the second athlete would have had a chance to break it, perhaps as an alternate or sole winning condition. This explanation would clear up several issues. First, it would resolve the otherwise blatant imbalance between the first and second athlete’s chances to win. Second, it would help explain the non-standardization of maika stones. For competitions in which the goal was to break the opponent’s stone, it would make sense that these athletes would experiment with the material, size, and shape of their stones to find a sturdy and destructive combination. However, without confirmation from eyewitness accounts, none of this can be verified – it is mostly speculation. To play ulu maika today, you’ll need a set of brightly-colored tent pegs and two thick, disc-shaped stones. If you’re having trouble finding the right size and weight, some bocce balls would make a good substitute. In a grassy field, plant pairs of tent pegs 2 to 3 feet apart from each other, making a straight path for the stone or bocce ball to travel through. The more tent pegs you put down to lengthen the path, the harder the game will be! Two players each take a stone or bocce ball and stand at least 10 feet back from the first set of tent pegs. Flip a coin to see who goes first. The goal is to roll the stone or ball as far as possible while passing between all of the tent pegs. If a player rolls their ball outside of the tent pegs, give them a second chance (or a few chances, depending on the age group). If both players successfully roll through the path of pegs, whoever’s ball rolled the farthest wins! The maika disks were fairly small, typically carved to be around 1 to 2 inches thick and 3 to 4 inches in diameter, though they could sometimes reach up to 6 inches. The middle of the disk was slightly thicker, giving it somewhat of a bulbous look, and the edges were carved flat like a wheel. Maika could be carved from many different kinds of stone, such as lava rock or sandstone. 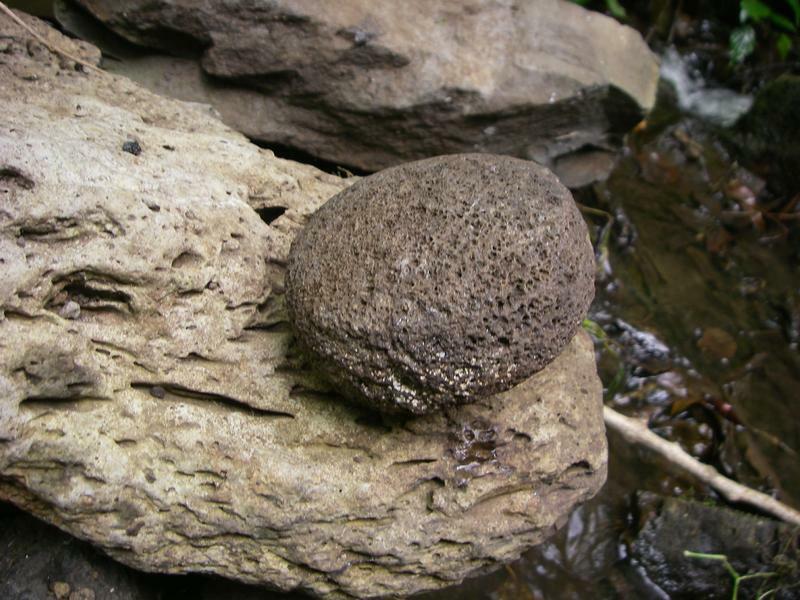 Early in the sport’s history, a half-ripe breadfruit, hard and spherical, was used instead of these more specialized stone disks. Likely because of this, a few early maika stones were also carved spherically, though the vast majority of those discovered in modern times are disc-shaped. The kahuamaika, the course on which the maika were rolled, is not covered in detail in any firsthand accounts of the sport. It was presumably made of packed dirt, as this would aid the rolling of the disk more than any other commonly available material. The edges of the course were marked by cord, which would suggest that it was important to determine whether a stone was out-of-bounds. As stones rolling out of the kahuamaika boundaries seems to not have been commonplace, it is fair to assume the course was fairly wide, though specific measurements aren’t recorded. Several firsthand accounts of ulu maika reference stakes that were planted on the course, through which the maika stones had to be rolled. Modern interpretations of these accounts often give these stakes a more central role than they probably played in this ancient sport. * Comparing accounts of ulu maika and pahee, a kind of spear-throwing game played on the exact same course, it appears that these stakes were simply course markers planted at the edges of the kahuamaika. In both sports, it was likely the case that passing the object (the stone or the spear) between the stakes was simply a requirement, not the goal of the sport. Were the goal simply to pass the object between the stakes, we would expect firsthand accounts of ulu maika and pahee to mention a great number of consecutive draws until one of the athletes made a substantial mistake. In reality, these stakes likely were likely used to keep the cord taut along the edges of the course, and perhaps to make the edges of the course more visible in the distance. *These interpretations can be easily seen in the modern rendition of ulu maika, in which the goal is to simply pass a stone disk between two poles set a short distance away. Cisco, D. (1999). Hawai’i sports: history, facts, and statistics. University of Hawaii Press.